Photographer Carol made this frame from beginning to end as a surprise 40th birthday gift for her husband, Matthew. It lives in their house and holds a portrait of the couple taken at Cathedral Park by photographer Dan Squires. Seattle-based Amy created this panel from start to finish for her parents as a gift for their 40th wedding anniversary. She will take it with her on her flight to Nebraska to help them celebrate and to give this finished piece to them in person. 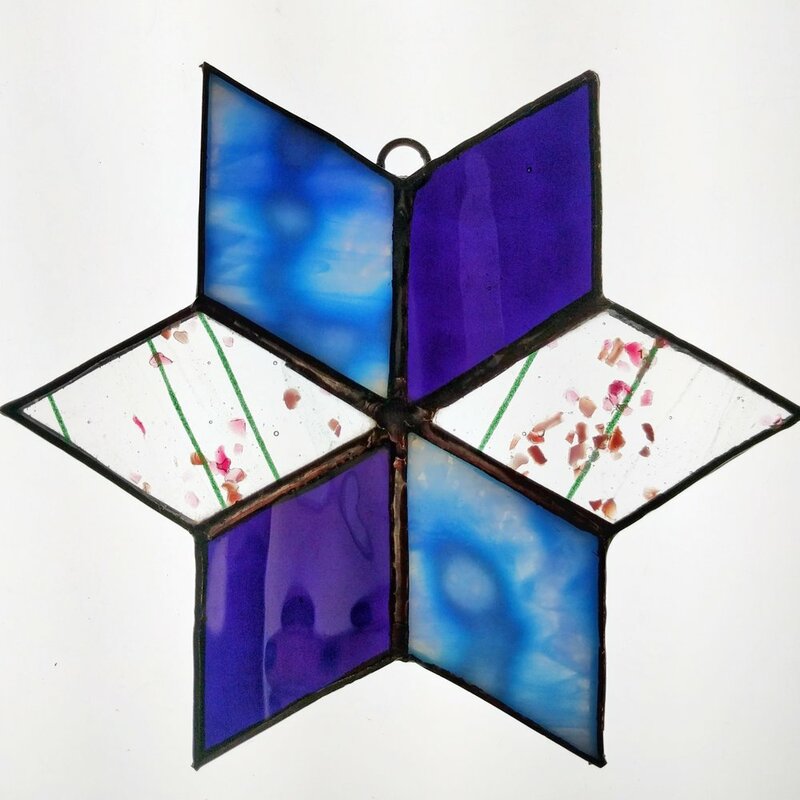 Glass enthusiast Brandy made this six-pointed star when taking a class from Vavroch Glass' Skip to the End Series. She plans to gift it to her grandmother and return to make another one to keep for herself. Cambridge, MA, educators Patty and Susan were Olivia's first ever informal glass students in her original Arlington, MA, based studio. Patty and Susan made these fiery suncatchers from a design in Glasseye, and cut, ground, and foiled the pieces themselves. After finishing these pieces, Olivia shipped them back East to be reunited with the original artists. Photographer and Vavroch Glass artist Dan Squires made this circle panel from a Vavroch Glass adapted design of an Art Nouveau fish. Dan made this piece from beginning to end. 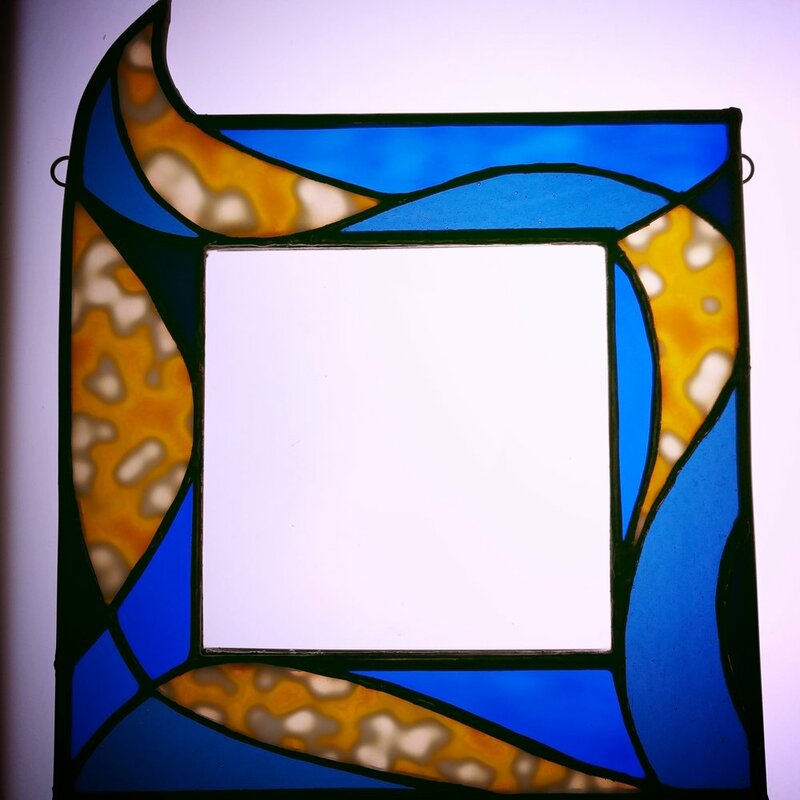 It hangs in a sunny window of his and Olivia's house next to his second stained glass panel, greeting all visitors at the gate before they enter the studio space. 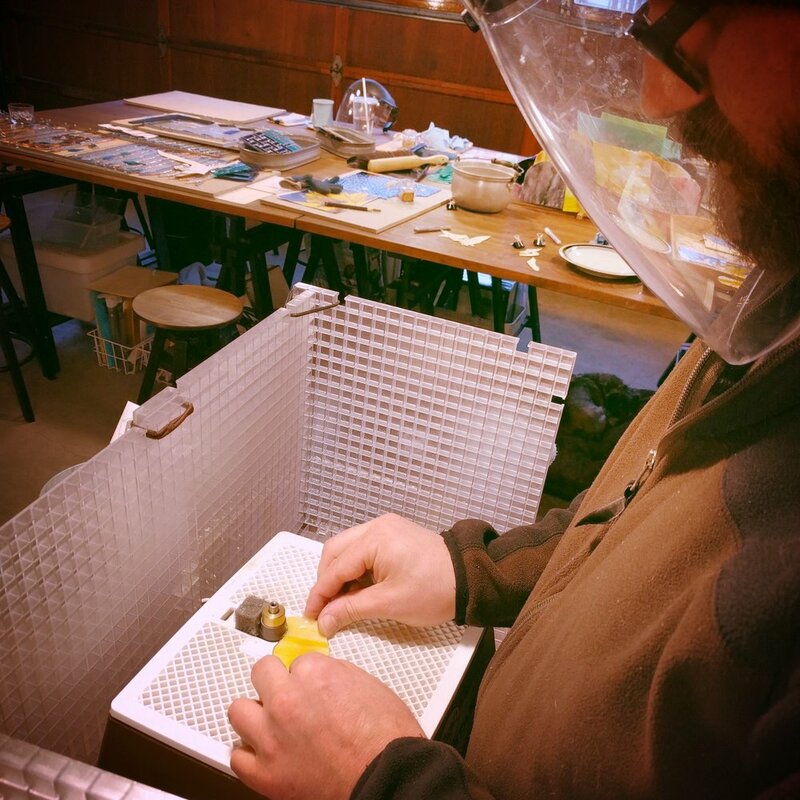 Images documenting all steps of the stained glass process as encountered by students and guests at Vavroch Glass Studio. Jonathan and Emily practice experiment with different glass cutting and breaking tools to find the tools that work best for them during an Intro to Glass session. After cutting and breaking his glass, Ben grinds the edges of his pieces so they fit together on his original pattern. 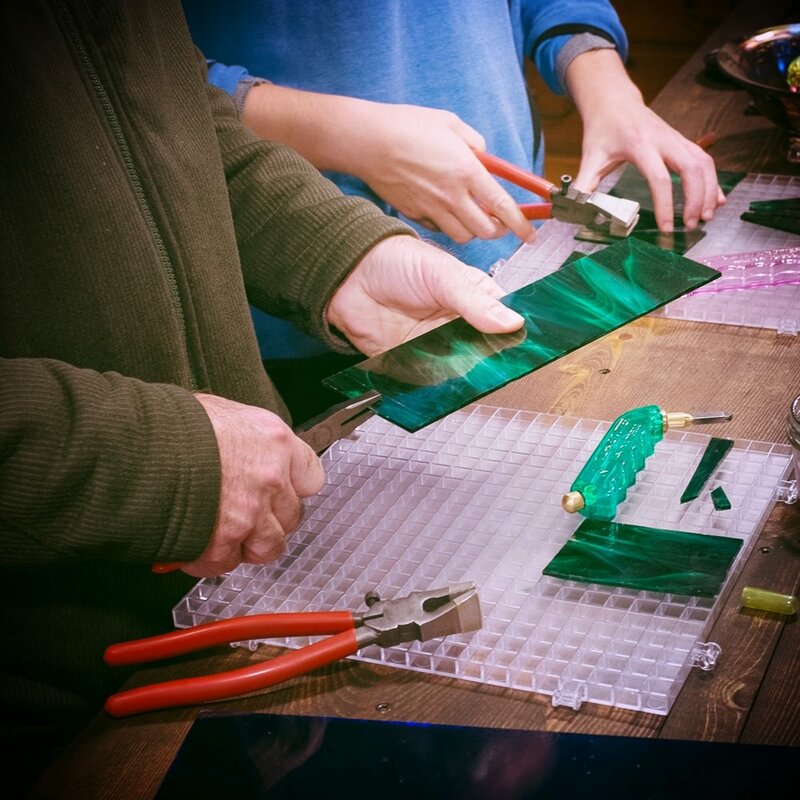 After grinding the edges of the glass, then washing his glass pieces off, the copper foil Ben will soon apply to the glass edges will stick evenly. Ben finishes cutting a challenging piece with both exterior and interior curves. 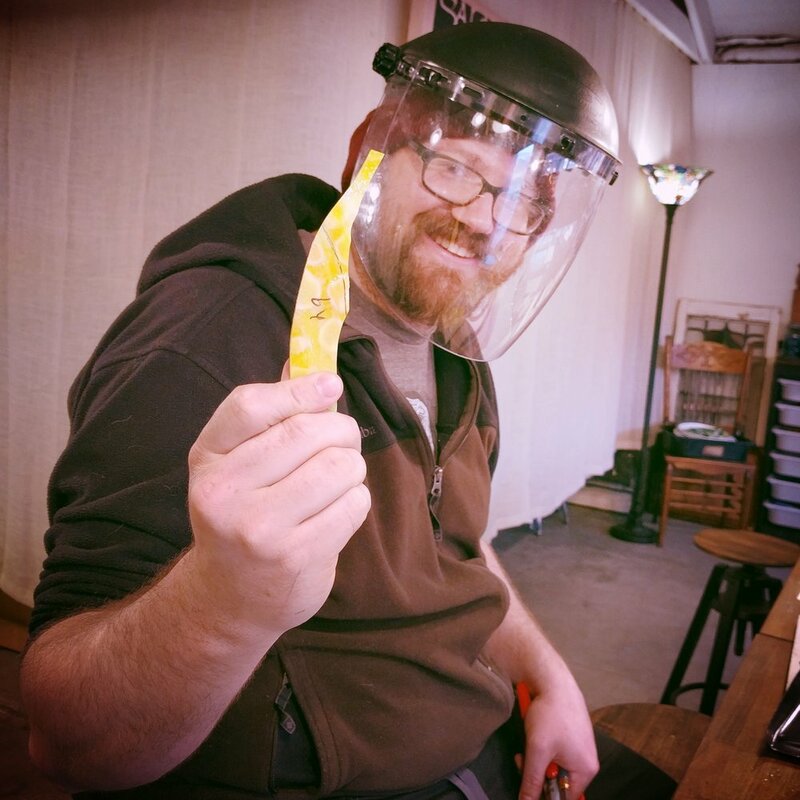 This is one of the last pieces he needs to cut before grinding the edges of his glass pieces so they all fit together as planned. 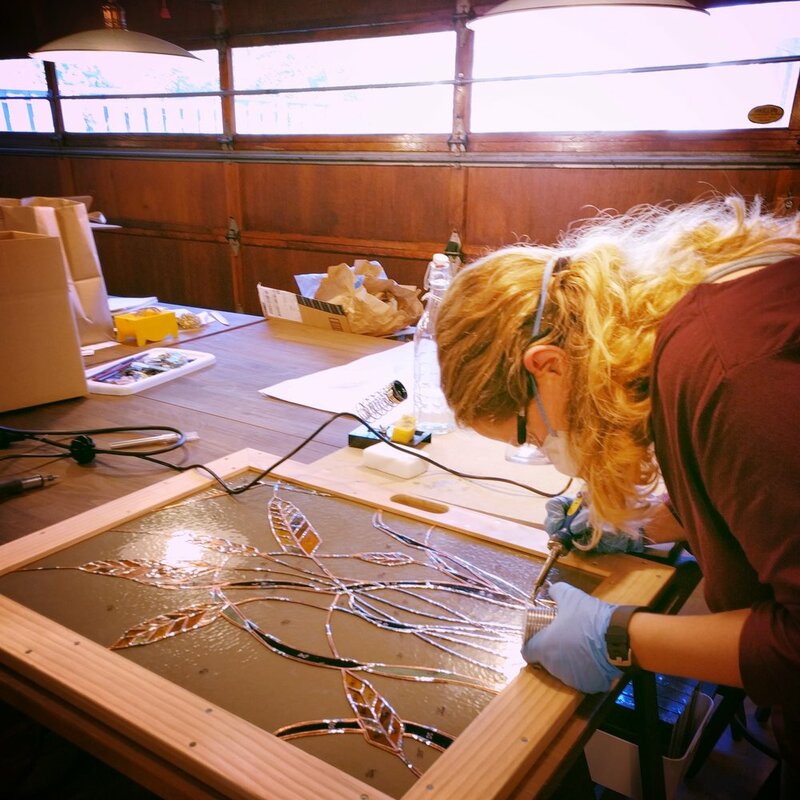 After cutting and grinding her pieces to make sure they fit just right, Kirsten applies copper foil tape around the edges of her art glass pieces. Solder sticks only to the foil and not the glass itself, and Kirsten's pieces will soon be ready for soldering. Amy applies small dots of solder to her foiled glass pieces to keep them stationary for the rest of the soldering process. She also fills any large gaps with crumpled copper foil to prevent solder seeping through to the other side of her panel. After soldering both sides of her panel and smoothing out all of her solder seams, Kirsten finishes removing excess solder from her panel of her pup, Luna.